In this core competent world, one must equip or empower oneself with some specific skills and abilities to be independent and expert in a certain specified field. There is a significant difference between understanding a project by theory or flow of information and managing the project itself, but one should know the information before implementing the project. Therefore, practical knowledge is the most essential criterion for successful evaluation of the electronic projects. 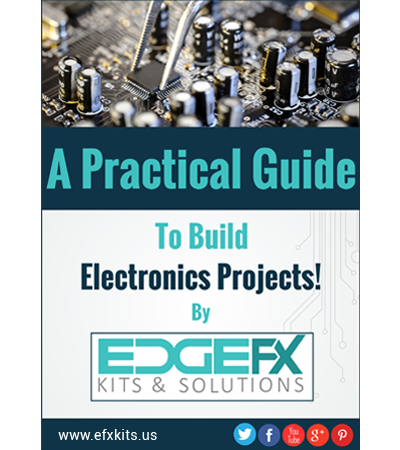 By keeping the above aspect in view, Edgefx Technologies has come out with an eBook for building electronic projects practically. To be more precise and practical, this eBook covers all the practical or action-oriented concepts of building the electronics projects. This practical guide covers all the basic topics and techniques for implementing simple to complex circuits. Edgefx Technologies assures that this eBook will be certainly helpful for the inception of doing projects and will work as a reference for electronic hobbyists and industrial experts. This eBook covers all the necessary electronic or electrical components’ information in brief along with the testing and application usage. It also gives weight to the assembling and step-by- step procedure for building circuits, soldering methods, troubleshooting, and so on. Each chapter gives optimum qualitative and quantitative information of the topic in view with relevant images. Precise information and understanding provide deep insights of the tools and circuits, which in turn provide working knowledge and create interest in the project to help improve the outcomes of the project. Thus, the below link will take you to the download link of this eBook. We assure that the adequate and essential information given in this eBook along with some tested techniques will help in learning hands-on practical concepts of electronic circuits with an unusually pragmatic learning approach. We anticipate your valuable views, feedback and comments and your overall perception about this book so that other readers might get inspired by this book.